It is quite a difficult task to play M2TS files, because many Windows and Mac operating systems don't support M2TS naturally. And M2TS doesn't make the list of major media players supported file formats. What to do if cannot play M2TS files? Download and install M2TS codec? It's really troublesome. Convert M2TS to common file formats? No. Instead, using a powerful free M2TS Player is the most direct and recommended approach for Blu-ray M2TS and AVCHD M2TS file playback. How to Play M2TS Files with Free M2TS Player? 5KPlayer is recommended as the best free M2TS player to play M2TS files on Mac and Windows, including Mac OS X 10.11 or before, Windows 7/8/10, etc. You just need double click on a M2TS file and play it directly without any glitches. M2TS is a container format commonly used for high definition video on Blu-ray Disc and AVCHD. Many popular HD camcorders, like Sony HDR-CX100, Sony DCR-SR47, JVC GZ-HD40, JVC GZ-HD10, Panasonic HDC-HS300, Panasonic HDC-HS20, Canon VIXIA HF200, Canon FS200, Canon VIXIA HFS100, Canon VIXIA HG21, etc. record videos in M2TS format. But when you transfer the M2TS files from camcorders to computers for playback, you find that your media player can't recognize and play M2TS files. 1. You can play M2TS files with QuickTime on Mac with Mac OS X 10.11 Mountain Lion or later only. 2. Only Windows 7/8/8.1 with Windows Media Player 12 can support for the playback of M2TS. Nevertheless, many users also complain that this M2TS Player can't cope with all M2TS files. 3. Playing M2TS files with VLC is always accompanied by various issues, like frequently freezing up, video and sound not synchronized, no audio, no video, etc. So, VLC is not the perfect M2TS player. In this view, it is necessary to pick out a good free M2TS player. There are good reasons why we introduce you 5KPlayer as the option for M2TS player freeware. 1. 5KPlayer M2TS media player enables users to directly play M2TS files for free without installing codec/plug-ins/components, or converting file formats. 2. 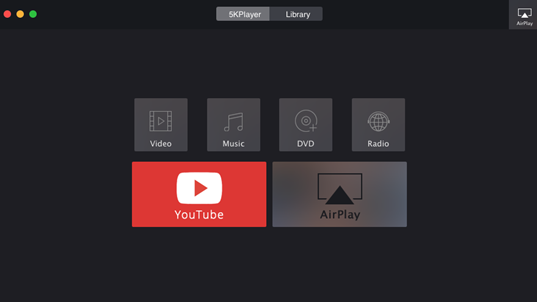 5KPlayer M2TS player is compatible with a great variety of Mac and Windows operating systems, including Mac OS X 10.7 Snow Leopard, OS X 10.8 Mountain Lion, OS X 10.9 Mavericks, OS X 10.10 Yosemite, Windows 7, Windows 8, Windows 8.1, etc. 3. 5KPlayer M2TS player plays HD videos including M2TS HD videos without any problems. 4. 5KPlayer is not only a M2TS player, but also the best media player support for all video audio formats, say, MKV, MOV, AVI, WMV, MP4, FLV, FLAC, AAC, MP3, etc. How to Use This M2TS Player to Play M2TS Files? Step 1. Download, install and launch this lightweight free M2TS player on your computer. Step 2. Drag and drop target M2TS file to 5KPlayer for playback. Step 3 (Not mandatory). Do some settings on the video based on your own needs. You can rotate the M2TS video, adjust the aspect ratio, view M2TS video in full screen, deinterlace the video if it is interlaced, fast-forward, fast-backforward, etc. Tips: This M2TS player only allows you to play M2TS files on your Mac/Windows computer. If you want to make the M2TS files organized in iTunes and synced to mobile devices for playback, or want to edit the M2TS video in iMovie or Final Cut Pro, you can always count on DVD video software for Mac/for Windows. Note: Not only acts as a powerful M2TS player, 5KPlayer is an outstanding all-in-one video music player available to play MOV, FLV, MP4, AVI, MKV, MP3, AAC, AC3 and other video audio formats. And it can play any SD/HD videos as well as free play 4K/5K UHD videos smoothly. Furthermore, It is also widely used to free download online videos songs from 300+ sites including YouTube, Vevo, Vimeo, DailyMotion and Facebook, and free stream video audio media files among iPhone, iPad, Apple TV and PCs. The best free VLC alternative helps free play any video, audios, DVD and even 4K, 5K UHD video on Mac/Windows. This article helps you find a best 3D bluray player software through a review of the top 5 of them 2019.